My garden has been in full bloom with roses and I thought that for upcoming Mother's Day (in the U.S.) it would be so lovely to make an English rose garden inspired wreath. It looks beautiful and it smells amazing (and I figured out a way to prolong its life by a couple of days too). I tied the wreaths together to allow some room to insert the flower filled water tubes. Fill the tubes with water and begin putting the roses inside them. Try and choose different kinds (and colors) of roses for a more natural and organic look. Insert the tubes into the grapevine wreath. Continue on adding roses until you have reached the desired fill and look. When finished, you will have a beautiful fresh rose wreath for mom that will last several days (and you can refill the tubes)! 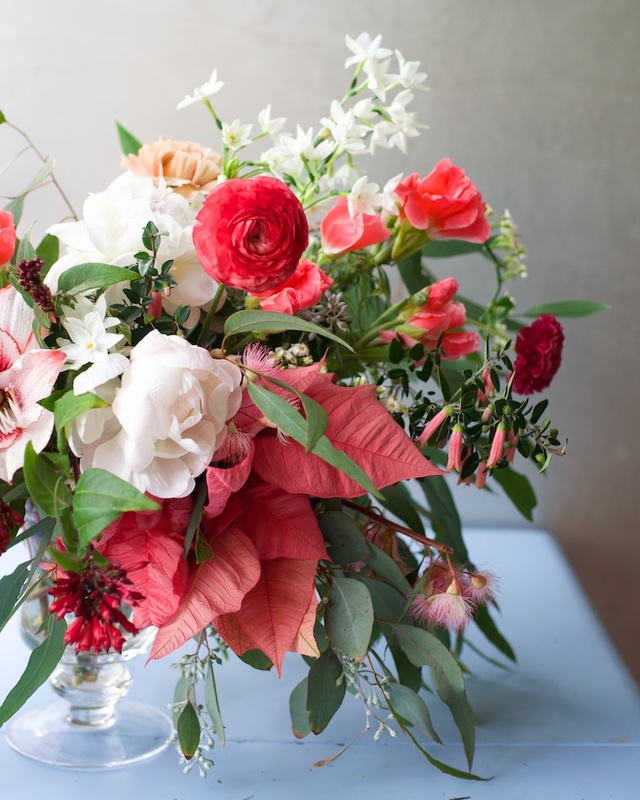 When it comes to holiday arrangements, peonies and passion flower might not be the first flowers that come to mind, as traditionally they have not been used during the holidays due to the fact that they are not generally available at this time of year. But, when I was at the market, I saw an abundance of beautiful passion vines (locally grown) as well as peonies (both from Chile and New Zealand). So, I gladly seized the opportunity to use them in this holiday arrangement. Begin by placing a couple of vines of the passion flowers in the vase. They will be used as the base of the arrangement. Save a vine or two for the final touches. As long as their stems are cut in an angle and in water the vines last a very long time and all of the buds will bloom into beautiful flowers. Add the lovely nigella. I have used the nigella both as pods and flowers in arrangements. Both are beautiful, but when the flowers are fully opened they are so whimsical and delicate. Now, add the viburnum. I love the hint of purple in these berries; the contrast really brings out the color of the peonies. Add the garden roses to one side of the arrangement. These are from my garden, and in addition to being really ruffly, they smell heavenly. Add the peonies. I only added three as they are so beautiful and big that there just aren't that many needed before they would overwhelm the arrangement! Here I took that passion vine that I was saving and made a loop on the side of the arrangement for some added beauty and volume. I wanted to add a little more Nigella, so I did just that!